Introducing Bill Kane, an LBI photographer, artist and entrepreneur since the 1930s. The youngest of six children, Bill has been coming to Beach Haven Terrace since he was an infant. His father, J.J. Kane, brought the family to an Oceanside summer cottage on Maryland Avenue in 1907. As a sales manager for the Fidelity Land Company of Philadelphia, J.J. welcomed visitors off the train with a shoe box lunch and a pitch to buy land in the new resort town. Couples were enticed with this free “Fisherman’s Special” day at the beach. “Not a single mosquito on LBI. No Siree! They’ve all married.” Spending many summers on the Island put sand in Bill’s blood and stirred his creative juices to remain here. 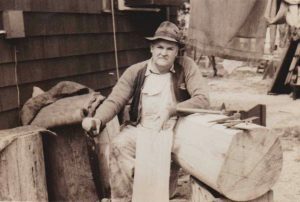 George W. Parker, father to 13 children, ran a restaurant and houseboats on Dock Road in Beach Haven. His eldest, Edna, met and married Bill Kane, a dandy in spats, in 1932. Bill and Edna’s home was built in the Terrace on Delaware and Long Beach Boulevard, by Howard Schiffler who would become the mayor of Long Beach Township . One room became the local post office with Edna as mistress from 1936 to 1945, allowing her to be at home with two children, Barbara and Lesley. 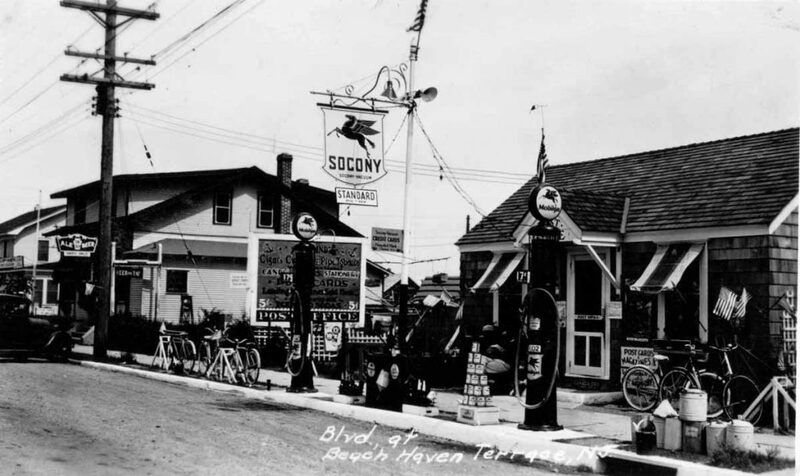 Being in the center of town was also a perfect location for a convenience store selling soda, ice cream (5 cents a cone) and gasoline at one pump (19 cents a gallon). Bill became a house painter and paperhanger. Communities were small then with less traffic allowing him to return home for lunch — some days even a nap. During off hours, he traded big brushes for small ones to pursue artistic work in watercolor, oil and ink. Ever resourceful, he used the old flagpole from the Engleside Hotel for his ship models in 1944. One from the ship the Fortuna is in the Beach Haven Museum. Bill’s self-taught drafting and lettering skills led to work for Harry Colmer, owner of the Beach Haven Movie Theatre. Each week a big banner would be hung to promote the new movie: Clark Gable in Mutiny on the Bounty or Lucille Ball in Follow the Fleet. Everyone would marvel over Bill’s quick, precise, freeform black lettering and characters on a 4 x 8 ft. piece of muslin fabric. In 1941, World War II changed life on LBI. Because Bill had two young children, he was exempt from active service. He had visions of using his newest talent as an aerial photographer in the belly of a B-29 Bomber. Instead, he became an air raid warden, checking nightly throughout town that no lights were visible to the east. Families were required to use blackout curtains as German U-boats prowled our coast leading to much fear of invasion. Bill traveled to Camden for work at the New York Shipyard each day with Charlie Robbins of Ship Bottom and the Beach Haven Schoenberg brothers. Car pooling in the dark at 40 miles per hour made the 50-mile trip west a grueling day. The unexpected September 14, 1944 hurricane created even a more harrowing trip. Once back on the Island, the fierce ocean waves washed the men out of their car in Brant Beach. Struggling through currents and dodging 14-foot poles uprooted from the pound fishing grounds off shore, they finally were able to break into a rooming house for safety. Late on the 15th, Edna was relieved to see Bill at the door. He quickly gathered his equipment and proceeded to take extensive photos of the storm-damaged towns for the papers. Bill had his own art studio and dark room. Imaginative projects included pen & ink illustrations for a self-published book in 1945, 75 Ship Yard Sketches. He also sold historic drawings of the Tuckerton Railroad and other LBI spots, china painting, cartoons for post cards. His photos were used each week in the Beach Haven Times. On summer afternoons, he’d set up a large sign at the charter boats docks, selling 8×10 shots of the happy angler with his big catch. adding framed photos, more art and post cards. Time passed leading to a “Mom & Pop” corner store in the 1950s for newspapers, candy and groceries. It became the neighborhood gathering spot with soft spoken and friendly Edna welcoming everyone. The local kids were fearful of serious Bill, who wanted to be in the art studio outback, not patiently waiting for a child to select penny candy. He’d say, “Come on, Son, it’s my dinner time,” whether it was or not. From the 1930s to the late 1970s, he never failed to snap amazing photos of fires, storms and major events here. Besides being a serious businessman, Bill liked quirky things and had a gruff sense of humor. In 1952, while driving Route. 9 in West Creek, he noticed a sign for the Mason Dixon line. Investigating further, he concluded that this imaginary, popular legend separating North and South went through Manahawkin and Surf City. He drew an elaborate map and posted a sign outside his shop lauding this fact — even selling post cards continuing the controversy. Often known as “Citizen Kane,” in 1957 he published a little book celebrating the 50th Anniversary of Beach Haven Terrace. It showed his drawings and photos plus research of the first families of the towns historic past. In 1976, to celebrate our Bicentennial, he painted the fire hydrants to resemble Revolutionary War soldiers. The colorful hydrants weren’t a happy or lawful sight to the fire department. Orders were dispatched to repaint them red ASAP. 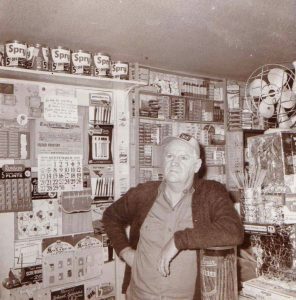 Bill and Edna sold the Nor’easter in 1980 to retire off island in Manahawkin. Still the creative genius, he saw beautiful art on travel vans and joined this trend by decorating his new, powder blue Chevy Nova. Large images of the Liberty Bell, Abe Lincoln and George Washington in bright colors were painted on the trunk. A monarch butterfly was the bright exclamation point. Bill explained his unusual creation was to help Edna find the car in the Shop Rite parking lot. A large stock of his postcards were eventually used as tickets for the historic trolley tours in the 1990s.